Burgers, Kebab's,Vadai's are my family's all time favorites. Being a pure vegetarian getting these dishes near by my place is quite limited. Moreover I like these dishes to be baked rather than deep fry in oil. 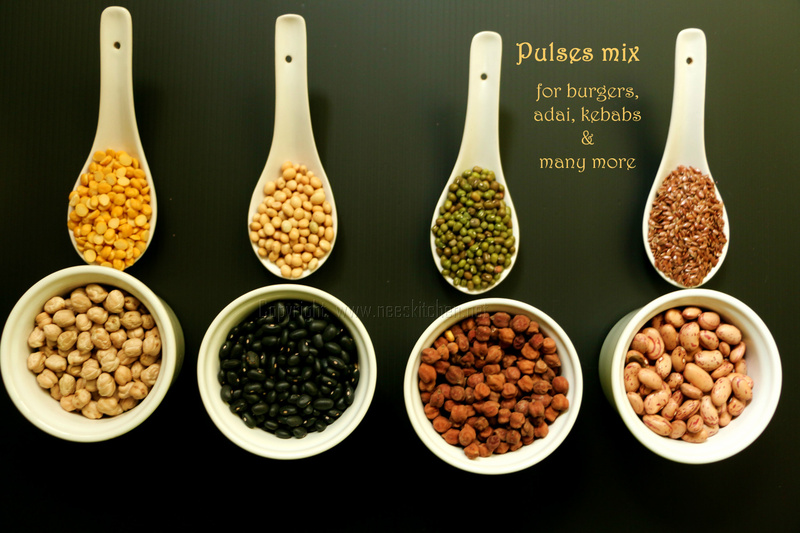 I tried various combination of pulses several times and finally this mix of pulses with oats or roasted dhal powder or bread crumbs for binding came out very well for Kebab's,patty for burgers and vadai's. The binding ingredients will not be included in this mix as they have to be added only towards the end. For Adai's I had to add some additional ingredients, which I shall be posting in the upcoming weeks. The burgers, kebab's and vadai's are all baked in oven and brushed with olive oil. You may also try the grill option in microwave though I have never tried before. You cannot deep fry this mix however a shallow fry should be possible the binding is with corn flour and bread crumbs. Personally I do not use corn flour in any of my recipes, hence I have not tried this option as well. The ingredients mentioned in the spoon needs to be in small quantity else they would either dominate the taste or would not bind the mix after they are cooked. Mix them and keep it handy so that its easy to use. You may follow the same proportions. Since this mix is high in protein consuming a small amount of quantity will fill up our stomach. Mix all the ingredients and store them in a container. The one cup measurement pulses can include Kaaramani,rajma also. Make sure the pulses mentioned as 2 spoon measurement is not altered. This includes tuar dhal,small yellow dhal. Chickpeas is a must for binding. Rest all can be changed. These pulses mix must be soaked in water for min 8 hrs.